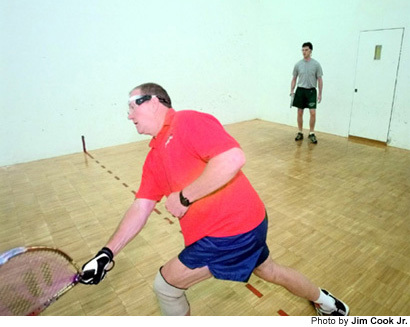 June 15, 1999 — Racquetball is the type of sport that can make the inexperienced player feel quite awkward. And when that inexperienced player shares the court with, say, an eight-time national champion, that awkwardness is aggravated — much like the inexperienced player at the match’s conclusion. Good thing eight-time national champions are good at making sure the pain is short-lived. Wehrle was right. Plenty of time left over, indeed. Four games. Two entire matches. All in 20 minutes and 27 seconds. Wehrle looked like a national champion out there. I looked, well, awkward. Neither should come as a surprise. Wehrle is intimidating. The 58-year-old Flowery Branch resident’s 6-foot-3, 225-pound frame appears even larger in the cozy confines of a racquetball court. Wehrle is an athlete. The retired Georgia Tech administrator played lineman for four years on the University of Iowa football team, and I have little doubt that he could still hold his own in the trenches today. Oddly enough, Wehrle was introduced to racquetball by former University of Georgia basketball coach Hugh Durham, who coached at Florida State while Wehrle worked there in the early 1970s before heading to Tech. In 1987, after dominating local, state and regional tournaments for nearly a decade, Wehrle decided to enter his first national championships. He won. He added three more national singles titles for his age group in 1989, 1990 and 1991. During that time he claimed four doubles championships as well. After a five-year hiatus, Wehrle began attending nationals again three years ago — and the time off didn’t seem to affect his play. He placed second in his age group all three years, losing this year’s championships in a heartbreaking 11-8 tiebreaker. My racquetball resume is far less extensive, almost nonexistent, actually. A buddy and I played occasionally in college — and even then I wasn’t any good. Evidently Wehrle saw my backhand before laying eyes on my forehand. Seeing either would have led him to the same conclusion — he was going to win. But that was obvious, and we both knew that going into our match at the Family Life Center in Gainesville’s First Baptist Church. The big question was whether I would be able to score a single point on Wehrle. And I had doubts, serious doubts. During his final 10 years at Georgia Tech, Wehrle accepted countless challenges from students who were sure they could manage at least one point against their aging administrator. Only one student was successful — one point in an entire decade. I didn’t like my chances. I liked them even less after we started playing. His power serve blew me away. His Z serve made me dizzy. And his lob serve left me just plain dumbfounded. When I wasn’t running into walls I was trying to out-think little green balls. Rarely did it work. Do I hit it before it hits the wall? After? Is it even going to hit the wall? Should I hit it against the front wall? The back wall, perhaps? By the time I made my decision, it was usually too late. I was left spinning in place and swinging at air. When I was lucky enough to manage a return, it was always a feeble one. And Wehrle would jump on it, crushing an unreturnable kill shot each time. Thanks to Wehrle, I now know that sound well. In fact, I think it’s still reverberating within my head. The first game went according to plan: 15-0 Wehrle in right around five minutes. Imagine my surprise when I took the first point of the second game. “I scored? Are you sure?” I asked incredulously. I should have quit then. Final score: 15-0, 15-2. We had been playing for only 10 minutes. Wehrle had barely broken a sweat. I think even he was surprised how quickly he finished me off. “Do you want to play again?” he asked. I’ll keep the score of that match to myself.